Rhododendron 'P.J.M.' is a small-leaved, compact evergreen shrub known for its beautiful and profuse spring flowers and neat appearance. It is probably the most adaptable and easiest rhododendron to grow. It is often used for group or mass plantings, shrub borders, or in a woodland setting beneath a high tree canopy. This rhododendron is exceptionally winter/cold hardy. The flowers which bloom in mid to late April are a vivid, bright lavender pink. This plant generally blooms heavily and reliably every year. The PJM Rhododendron is also known for its foliage which is dark green and slightly shiny in summer and turns a plum purple color in fall. 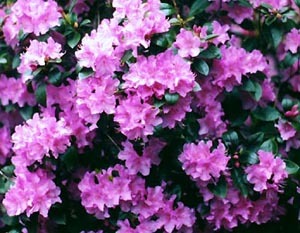 Plant the PJM Rhododendron in partial shade to full sun. More sun exposure will create more winter foliage color. It will grow from 3 to 6 feet in height and has a rounded outline.